When you think of a holiday in the West of Ireland, the picture that first comes to mind might be the wild beauty of craggy cliff tops and rolling green hills… quaint white-washed villages and the open warmth of locals just waiting to share their stories with you. All this is true – but what you may not know is that this beautiful part of the world is also home to some of the best foodie experiences and feasts of flavour you could wish for. Once tasted, who could forget the creamiest of chowder’s made with the best of wild Atlantic seafood… or the taste of real, home-cured farm bacon? The great news is – Doolin is the crowning glory of it all! Geographcially-speaking, Doolin is located right in the middle of ‘Ireland’s Food Destination 2015’ – with the Burren awarded the accolade of ‘A European Destination of Excellence for Gastronomy’. Located on the Wild Atlantic shores, the area truly is a natural larder of goodness. You’ve got the Wild Atlantic shoreline on one side, rich with fish and seafood, and on the other there’s the land that is super-rich in limestone, producing beef and lamb of the most superb flavour and texture. Whether we’re talking firm, white cod in fluffy traditional ale batter, or tender, farm-reared steak – you’ll have to go a long way to beat this place for a premium food experience. And whether you choose the expert hands of local Michelin Star chefs, or simple artisanal cafes – you’re in for a treat. 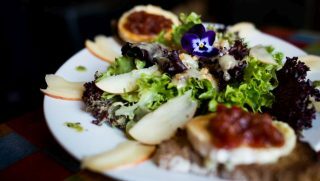 If you prepare a systematic approach to your food experience, then perhaps follow one of the famous Burren Food Trails. There are four to choose from: Farm to Fork Trail, Trail of the Ocean Trail, Nature Child Trail and Burren Cheese Trail. Or decide to find your own way and discover the pleasures along the way. Starting out from Doolin itself, there is so much to discover. Like the wonderful little gem, Clare Jam, which offers delicious home-made preserves and unique treats like Guinness mustard. Next up is the Doolin Chocolate Shop, which stocks tantalising handmade Irish Wild Chocolates – from fudge to liqueurs and bespoke chocolate bars. Or decide to find your own way and discover the pleasures along the way. Starting out from Doolin itself, there is so much to discover. Like the wonderful little gem, Clare Jam, which offers delicious home-made preserves and unique treats like Guinness mustard. Next up is the Doolin Chocolate Shop, which stocks tantalising handmade Irish Wild Chocolates – from fudge to liqueurs and bespoke chocolate bars. There are plenty more local food heroes too, not least of which is the Burren Smokehouse in nearby Lisdoonvarna. Dubbed ‘the best smoked salmon taste you’ll ever experience”, the Smokehouse offers smoked organic salmon, smoked mackerel and trout. You can watch the artisans working their magic, taste samples and buy your choice of goods to take home. There is also a brilliant range of jams, chocolates, biscuits, honeys, fruit and wine – as well as Irish craft gifts and beauty products. If cheese is your weak spot, you’re in the right place too. Aillwee Cave Farm shop is the production site for the award-winning Burren Gold Cheese – a firm textured Gouda-style cheese with a rich creamy taste. It’s the unique rich grasses and herbs of the Burren on which the cows feed that makes the spectacular taste difference. Staying with cheese, why not head over to the beautiful St Tola Goat Farm in Ennistymon, home of award-winning goats cheese. Explore the farm, discover their story of sustainable farming, and taste the range of cheeses. If you have a sweet tooth, indulge it at the famous Linnalla Creamery on the Flaggy Shore, which makes outstanding ice cream and smoothies produced from their own livestock, foraged fruits and nuts. If you’re really looking for a natural experience, don’t miss Wild Kitchen – which offers wild food foraging walks through the countrywide and shoreline. From wild plants to seaweed – you’ll be amazed by this unique food story. For a spot of fine dining, you’ll be stuck for choice too. The Wild Honey Inn in Lisdoonvarna has just been promoted from Bib Gourmand to full Michelin star, offering refined bistro cooking with the ambience and warmth of a traditional country inn. Then there’s Moy House in Lahinch – famed for its six-course tasting menu, and a daily la carte menu, using fresh produce from the gardens and neighbouring farms. An event on the foodie calendar you won’t want to miss is the Burren Slow Food Festival – a celebration of talks, cookery demos and special culinary events that includes everything from a slow food banquet to a salmon and champagne pairing and farmers’ market. For delicious treats in between it all, you need look no further than Doolin Inn’s own coffee shop – for delicious coffees, cakes and pastries, fresh from the oven. As with most things in Ireland – it’s the joy of the unexpected discovery that makes our region such a haven of great tastes and foodie favourites – so come hungry and be ready to explore. Help yourself, and enjoy!